High-performance engineered rubber lining solutions for mining and mineral processing equipment. Engineered molded-rubber linings from Corrosion Engineering are cost-effective, versatile components that protect mining applications from corrosion, impact, and abrasion. Molded-rubber lining systems from Corrosion Engineering represent the cutting-edge of rubber technology built on four decades of innovation and evolutionary development. Our rubber lining components not only provide excellent impact and abrasion resistance, but they also reduce noise and vibration, are lightweight, are engineered to prevent sticking, and outperform other wear materials, such as steels, alloys, and alternative elastomers. Whether our customers need to line their tanks, conveyor skirts, sumps, chutes, hoppers, or even their truck beds, we have the perfect product we can custom-tailor to your unique application. 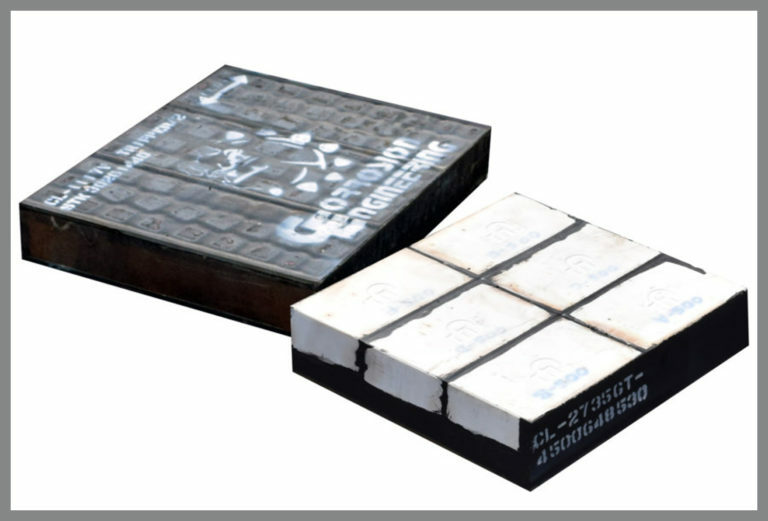 Haul Truck Liners by Corrosion Engineering are made with the highest quality, highest tensile rubber in the industry, developed to considerably outlive rubber and steel liners made by other manufacturers. CorroPlate is an economical rubber and steel wear liner designed to exceed high demands, increase safety, and have longer wear life compared to steel and other wear-resistant materials. Corrosion Engineering’s haul truck bed liners provide exceptional wear and impact resistance to dramatically increase availability, decrease maintenance, and improve productivity of your fleet. Corrosion Engineering’s crusher wear parts offer superior abrasion resistance to protect the crusher and feed areas and effectively reduce material handling cost per ton. MagPatch is a magnetic patch liner that is a simple yet powerful solution for quick, temporary repairs to holed or damaged material handling equipment. Dead bed and wear bars from Corrosion Engineering provide outstanding wear and abrasion resistance in demanding applications exposed to severe wear conditions.